If you guessed “c”, 68 miles per hour, you got it. Considering how fast they travel, it’s a wonder fishermen can catch them– but they sure do. Sailfish put up a good fight. If and when you get one, you’ll be impressed with its size and strength– definitely worth a picture to show all your friends and family. There are actually two versions of common sailfish– those in the Atlantic and those in the “Indo-Pacific” oceans. 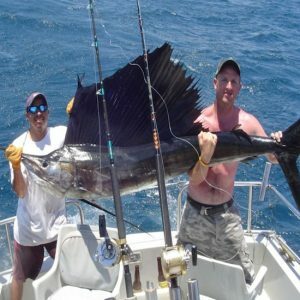 In general, sailfish are blue/gray in color and they’ve got white underbellies. If you wondered how they got their name, just look at their large dorsal fin. It looks like a sail. This fin stretches almost the length of their body and it’s quite high– in fact, it goes higher than the fish goes wide. Obviously, these fish stand out for their looks alone. Sailfish are often found near the surface of the ocean trying to use their sails to essentially catch dinner, which is typically sardines, squid or octopus. Their upper jaw juts out beyond their lower jaw giving them a spear-like “mouth” appearance. Do people eat sailfish? Not much. They’re more of a game fish. Some fishermen have taken hours to land one because sailfish are leapers and divers who do not want to be caught– which makes it all the more rewarding to get one.